Food has it's own unsuspecting language; we use it everyday not only to nourish but also to bring people together, to express affection and to break barriers. When my Lebanese cousin married his Italian girlfriend, he took the Libaliano concept to an extreme. To celebrate love and a happy event, I hosted a lunch for family and friends. It was on the first day of spring and the weather promised sunshine and the option to sit out in the garden. We started the celebrations with champagne and nibbles. I made pastry triangles filled with spinach and pine nuts - fatayer, which I served warm next to, minced meat and pine nut pastries or lahm bi ajeen. Later we ate rakakat bi jebne- crisp filo cheese rolls and - my favourite- pumpkin kibbe- plump little rolls made with burghol and pumpkin, stuffed with Swiss chard and walnuts. For lunch I put together a variety of Mediterranean flavours; home-made pasta, a selection of salads and rolled vine leaves. On the day before the wedding, armed with Maria’s recipe and motorino for the pasta machine, I prepared homemade ravioli filled with peas, ricotta and mint that I served with lemon butter. Another Italian touch was farro, an ancient grain, which was grown extensively in Roman times and most probably planted in the Bekaa valley. 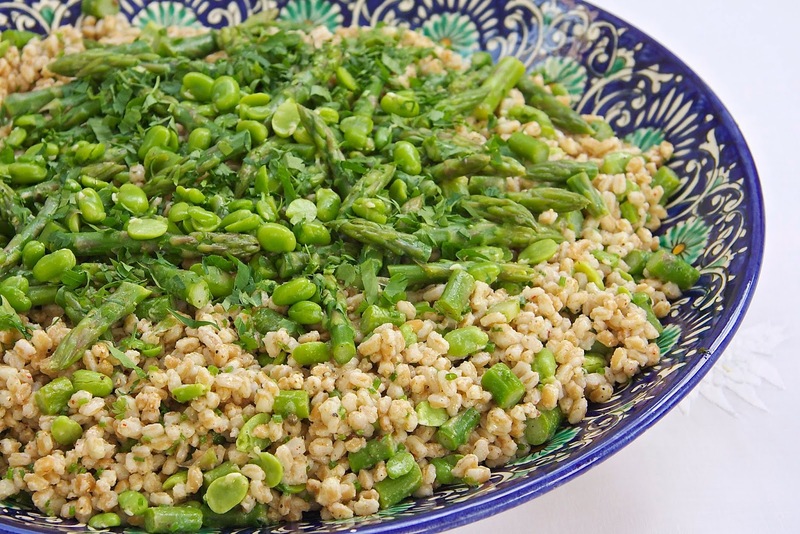 It was the perfect base for the new season’s flavours: asparagus and broad beans. The centrepiece of this spring buffet was a mega dish of rolled vines leaves and lamb culets. As some of you may know, vine leaves are served formed like a cake which means that you need a pair a strong and dextrous arms to hold the dish on top of the pot and turn it upside down; you would need to keep the pot in place for a few minutes before removing it to make sure that the vine leaves stay together. This was such a huge casserole that for a moment I thought it would collapse, and… it partly did! My grand moment went out of the window but it nevertheless tasted just as delicious. Aromas floated and for a brief moment I worried about the chaos of this babel tower where each dish spoke its own individual tongue. But then, I am by nature a worrier. 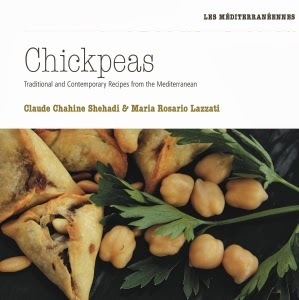 Just as friends and families treaded carefully into each other's lives, Lebanese and Italian food mingled. It gave a sense of belonging to some while others performed a leap of faith and an act of discovery. As soon as people settled to eat and began to enjoy the food, I was content for it all naturally fused. Just like my cousin and his bride, here, in the very Libaliano Kitchen, I had put together a marriage made in heaven. Scroll down for recipe of Mihshe Warak Enab. Cynthia Stroud from Pretty Gorgeous Cakes made the beautiful cake. 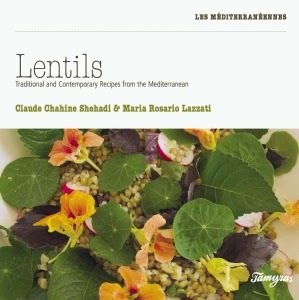 The tender shoots of vine leaves are usually collected in late spring. Should you happen to have one growing in your back garden, pick the small leaves goring towards the tip of the branch; either cook them straight away or preserve them for the store cupboard. Alternatively you can nip to the nearest middle eastern shop and buy them in jars. Mehshe warak inab is time consuming. It takes practice and patience. Do allow about an hour to roll the following quantities or make a party and invite your friends to lend a hand! Don’t worry; the final result is rewarding and delicious. 1. Heat a heavy based pan and add one tablespoon of olive oil. 2. Pan fry the lamb chops for 3 to 4 minutes on each side. slice 1 large beef tomato and place it in the bottom of a deep 20 cm pot. 3. Arrange the cutlets on top. 5. Add the garlic cloves and cinnamon sticks. 6. In a large bowl, combine minced meat, spices and rice. 7. Take out the leaves of their container. If in brine, rinse and strain them. 8. Bring about 500 ml of water to the boil. 9. Immerse the leaves and leave them in for 2 minutes from the time it comes back to a boil. Blanching, makes them softer and easier to roll. 10. Transfer to colander. You are now ready to roll. 11. Take one leaf and place it flat on a work surface with the smooth side down. Place it, so the pointed side is away from you, the closer side being where the stem is. 13. If the leaf is large, cut it in half along the rib. Turn it so that the middle part faces you. 14. Arrange about ½ teaspoon of meat and rice stuffing in a straight line (about 4cm long and 1 cm thick) across the wider part of the leaf. 15. First fold the sides over tapering them slightly towards the bottom. Now fold and tuck the top edge over the stuffing and roll it to the end. 17. Place the rolled vine leaf with the loose end down and over the lamb chops in the saucepan. 18. Keep rolling the leaves and arranging them in a neat circular row over the chops. When you have finished one round, place some rolls in the middle of the circle and then start another layer. 19. Keep layering until you finish all the leaves. 20. Cover the vine leaves with stock. Add about half a teaspoon of salt, bearing in mind that your stock may already be quite salty. 21. Place a heat proof plate on top of the rolls, to weigh them down and keep them from expanding and losing their shape during the cooking. 22. Bring to a boil and reduce the heat to low. Leave to simmer gently for 1 hour and 30 minutes. 23. After the cooking time has elapsed, taste one roll and check that the leaves are tender and well cooked. If not, cook for while longer, making sure that you have enough cooking liquid left. 24. Add the lemon juice and cook for a further 10 minutes. 25. Allow to rest for 5 to 10 minutes before serving. 26. First, pour out the cooking juices into a bowl and reserve. 27. Take a large and deep serving dish and place it over the open saucepan. 28. Hold the saucepan’s handles and the sides of the dish on either side and with both hands. 29. In one quick move, turn the saucepan and dish upside down to end up with the saucepan over the serving dish. 30. Place on a worktop and leave to rest for couple of minutes before lifting the saucepan away. You should get a perfectly shaped vine leaf cake with the lamb chops on top. 31. Return some of the reserved cooking liquid. 32. Remove the cinnamon sticks and serve immediately.